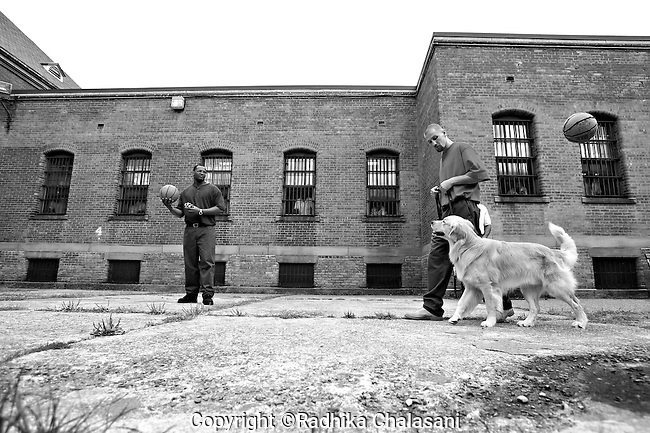 BEACON, NEW YORK: Andy (R) walks Rezzie around the courtyard to teach him not to respond to distractions as balls are thrown around during a training class for the Puppies Behind Bars program at Fishkill Correctional Facility. The program prepares puppies to be service dogs and consists of one day of class a week on topics such as obedience training, grooming, basic care of the dogs. The dogs spend 18-20 months in the program working with the prisoners.